Greetings, and welcome back! I’m excited about getting back into blogging after this two-month hiatus. I’ve had a lot of time to think, and some important discussions with friends and family. Today I’ll be wrapping up our foray into Training Faithful Women, and be giving some closing thoughts on the topic. Ok, I feel like I need to tread lightly here. This particular passage, on the surface, is not all that troublesome. To a certain extent, I agree with Gothard. 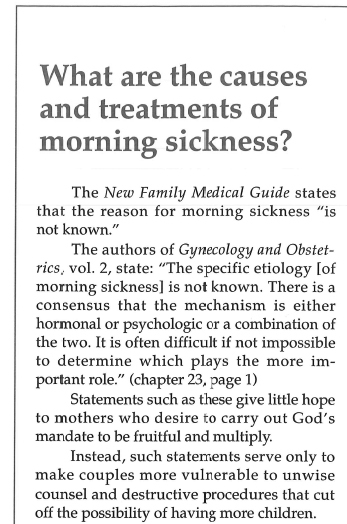 Many Christian parents have somehow bought into the idea that children are, if not a curse, at least a horrible nuisance. It is honestly quite upsetting to go into fellowship halls, or Sunday school rooms and hear what some parents say about their children. It’s much more than someone sharing their struggles; it’s often just a kid-bashing party. Even parents who don’t have anything to complain about get in on the action, bemoaning the fate that awaits them when their ticking time bombs decide to make life a living hell. Yes, children are bothersome. I’ve spent over an hour writing this post so far, because I’ve been interrupted so many times trying to get the two month old to calm down and stop crying. I get that kids can be difficult. But many parents are in need of a serious gut check about their own attitude towards their children. 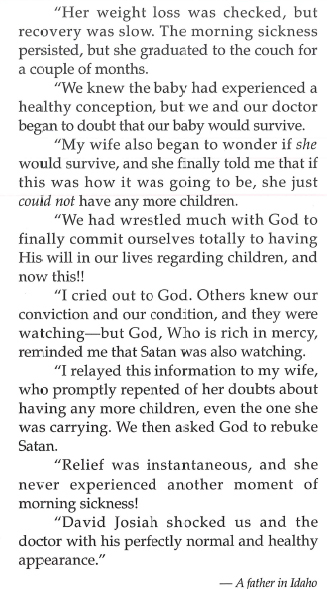 But the issue here is that Gothard has taken a much more radical stance than “keep a positive attitude towards your children.” Gothard raises importance of the birth of children (and not just children, but large numbers of children) to an unhealthy level. In ATI world, those with large families are lauded, and held up as perfect examples to follow. Regardless of health, regardless of financial situations, regardless of housing conditions, Gothard preaches that true Christians must have lots and lots of children. 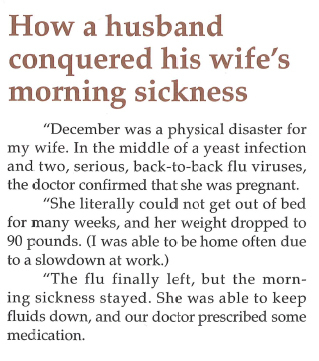 We’ve already seen an example from an IBLP booklet in which a husband was lauded for ignoring the fact that his wife feared for her life and instead brow beat her into agreeing to having more children. This is the opposite of grace. This is hard, cruel law, devoid of love, compassion or understanding. Grace understands that different people have different abilities. Some parents can raise 8, 9 or 14 children and provide the needed attention, training and love. Some women are able to give birth to many children without losing their health. Other women struggle after one or two children. Some families have children with special needs that require many times more attention than most kids. There is no one-size-fits-all answer to the question of how many children you should have. Preaching that there is places the future of many people at risk. Oh my, how insulting can you be in three paragraphs? First is the assumption that a wife can only add to the husband’s income. That’s kinda funny for my family, because my wife actually makes more money than I do (it turns out that formal education actually does make a difference, and having a master’s degree is enough to bump you up a pay grade). 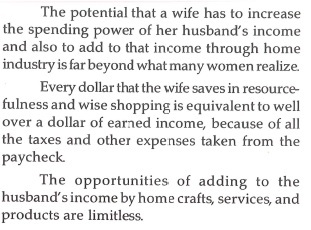 Second, it’s interesting that there is no IBLP material that suggests men supplement the family income via “home crafts.” This hearkens back to issues I brought up with David Gibbs Junior, and the way he made fun of a female doctor, as though her gender prevented her from practicing medicine. Because, in IBLP world, being female means that you really are only good for certain things. You’re only good for having babies, and encouraging other women to have babies. And if all those babies put strain on your budget, you’re only real option is to knit potholders, because the 1950s really were the greatest time in the history of ever. Well, we’ve finished the ten reason why your church should start this ministry. 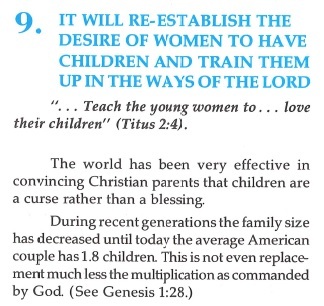 The rest of the booklet lays out a plan for finding the correct woman to run this ministry and training her to run it. I’m not going to take the time to go through everything as thoroughly as I have up this point, or we’ll be in this booklet forever. I’ll just take time to grab a few pieces of crazy and hold it up for us all to laugh at. Wow…one of items on the checklists for pastors is to “be deeply convinced by the Holy Spirit that the training of faithful women is not an option.” Is it just me, or is the impetus for the moving of the Holy Spirit placed on the wrong party? 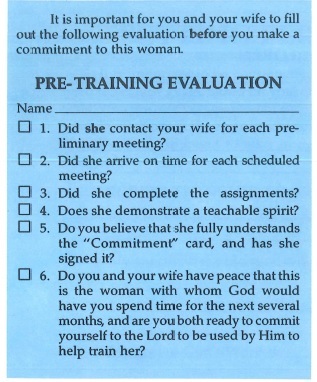 At the end of the booklet we are given a schedule for how to train this first “faithful woman.” It’s pretty funny. At the first meeting (which you cannot arrange; your wife must call this lady and schedule the meeting. Also, your wife has to be there for every meeting, but she has no actual role in any of the meetings) you are to give this woman an assignment, such as reading a book or memorizing some Scripture. Tell her to call your wife (not you) when she’s done her homework. I can’t help but laugh at the mental image of a young pastor calling an older woman into his office and giving her homework like a 6th grade kid. At the third meeting, you give her more homework! This time it’s a “personal spiritual evaluation” (how convenient that such a form precludes the need to observe and test a person’s fruits!) and a form on which this poor woman can write down a bunch of goals for you to judge. There’s also a special NOTE (in all caps, just like that), telling you to be certain that you have not made any commitments to spending time with this women up to this point. I guess she’s still on trial. Oh boy! The fourth meeting! This is the meeting in which you actually explain your purpose in meeting with her all these times! I guess you have to be sure that she’ll put up with loads of BS before you let her in on the deep, dark secret that you want her help in the women’s ministry at your church? Oh, this is rich. They don’t actually tell you when to use this form, but there’s actually an evaluation form that you are supposed to fill out. This will help you decide if this woman is perfect enough to invest time in. Honestly, what self-respecting woman would allow her pastor to treat her like this?